Body Sport USA designs and markets skydiving jumpsuits for recreational and competition skydiving. We've been designing and building jumpsuits since 1992. We also specialize in special purpose outer wear for diverse applications including the military, rescue operations and movie production. Jumpsuits are a custom piece of skydiving equipment that you should buy directly from us or one of our authorized dealers. Our competition and recreational skydiving jumpsuits include: Comp Suit, Crater Suit, Camera Suit, Free Fly Suit and Free Fly Pants. For military and para-military operations we design and build several styles of Single and Double Zipper jumpsuits including a double zipper Crater Suit with wings for standardizing fall rate in free-fall. 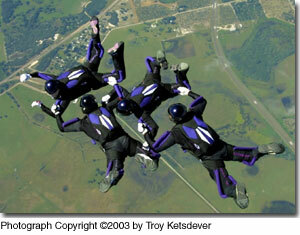 Body Sport USA is your best skydiving and military jumpsuit source! Quality, performance, and service - what else do you need?